What’s wrong with telling the truth? Have you noticed that truth is something people do not like to hear? Why is that? Do your children like it when you tell them the truth,as in “no,you cannot get into Harvard with those grades”? Does your spouse like it when you tell them “I’m sorry but we just can’t afford a vacation this year”? There can be a sense of finality in the truth,a sense of “well,that’s the end of that”. And oh how do we not like that! Have you ever lost a friend because you told them the truth? Ever lost a business associate or account,your job or position,your church? Well I have,and I can tell you that sometimes telling the truth can be costly,even though it shouldn’t be. Truth is one of those things that used to be valued much more than it is today,and I think that we as a society are much worse off because we have devalued truth in favor of man’s opinions. If you really think about this,truth is something that the carnal man rebels against because when you break it down we all want our way,don’t we? Truth is sort of like rules,and we all know how we feel about rules.The truth says “no you cannot”or “no it is not”. Humans don’t like that “NO” word,do we? Truth is an absolute.It contains facts.It is irrefutable,even though we pay huge sums of money to people who argue that the truth isn’t really the truth.And as much as we might like to believe this,truth,like beauty, is not in the eye of the beholder.It is what it is. So if Jesus taught the truth,and based upon how many times truth is mentioned in the scriptures,what’s wrong with telling the truth? Why has telling the truth seemingly gone out of style in our society.And yes,in our churches as well? I think it’s because we don’t like the finality of “truth”. Let’s face it-we want options,and truth doesn’t leave room for options.Our lack of desiring the truth has spawned a sub culture wherein lies and falsehoods have supplanted the truth to such an extent that most of us don’t even know what is truth and what is a lie. The gospel message is one of truth and absolutes.There are no grey areas where the message of eternal life is concerned.The gospel contains no “half truths”. If it did it wouldn’t be the truth.Jesus did not leave any room for error in His message,and frankly it is not even open to debate.And I know most will not accept that statement. Jesus spoke truth here.He did not say you might not see the kingdom unless you were born again,he stated he cannot see the kingdom unless he is born again. HUGE difference!This statement is non negotiable.It is not open to debate.It is not a point over which we can disagree.It is a truth.A Gospel truth. I don’t know where you are in the great debate over truth.I only know that the Word of God is truth and as such that is my foundation. Everything else is measured against the Word.Many will call that narrow minded and if that is the case,then so be it.I refuse to measure truth by the world’s standards because they are ever changing.Not only that,but the world’s standards are pitifully inadequate to raise us up above our sinful condition. Regardless of the cost truth is one thing that cannot be compromised,twisted,or distorted in order to fit the needs of society. To do so is to build our house on the shifting sands of opinion. I’ll take the sure foundation of the Truth,regardless of the cost.How about you? The gospel of John is far and away one of my favorites books out of the 66 books that make up our Bible.In it you will find just about every conceivable human trait on display at one time or another,and I often marvel at the sheer range of emotions found within it. All of these and more are on display. Life is on display here. Whenever I read John’s gospel I look to the end of the book with apprehension,knowing of course that before I get there Jesus is going to be violently murdered.But before the lies and betrayal, before the accusers line up to spew forth their hate filled demands for vengeance, Jesus spends His final hours doing what He always did. Jesus taught his disciples that He had a commandment for them. And that commandment was that the disciples were to love one another as Jesus had loved them. What? Jesus is within a few hours of enduring the most horrific death imaginable. And He knows it’s coming.It’s unavoidable. He knows it’s coming because it was for this hour that he came into the world. Yet His focus is on imparting one last word to those who had walked with him for over three years. His focus was on love,and more specifically that the disciples would love one another like He had loved them. All of this begs the question “what kind of love is this”? Well,for one thing Jesus loved them to death,didn’t He? He even went so far to say that there was no greater love than this,that a man would lay down his life for his friends. Other worldly love. Incomprehensible love. God love. I’d like to know that someone loved me this much,wouldn’t you? Grape vines.Have you ever seen one in person? When I was a young boy I would find them growing wild in the woods where they would attach themselves to the trees. For an adventurous young boy like me they offered a rare opportunity to grab one and swing from them like Tarzan! And even though these weren’t the type that produced grapes,they sure did produce a lot of fun! It wasn’t until later in life that I learned that grapes came from grape vines.That’s probably about the time I realized my “Tarzan” days were over. I see many homes around me that have grape vine trees used as decorations.I have a large one myself on the front porch and at night it’s very pretty, all lit up like it is. So I guess what I’m saying is grape vines aren’t all that unusual after all,and there are a lot of uses for them.And if you’re using them as a food source,they require a lot of hard work. But more about that in a minute or two. When you look at a grape vine from a biblical point of view,you begin to understand that they were very important in older cultures. 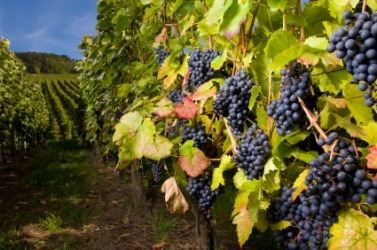 They produced food,either as fresh picked grapes or dried into raisins,and of course they were used to make wine,another very important part of the culture of the day. In the two verses I quoted above Jesus is making the statement that He is the true vine. Not a wild vine,or not a grafted vine,but the True Vine.And that’s important folks.It’s important in the sense that there can only be One True Vine.Oh,there can be off shoots and secondary vines,etc….but they all emanate from that One True Vine. Jesus is telling us here that He is the source,or that He is that One True Vine that all others are attached to. Then He says that the Father is the vinedresser,or the one who actually does the work that is required to keep the branches producing at maximum efficiency.Yes,grape vines require a lot of work.They must be kept pruned in order to produce the greatest yield.Old branches that no longer produce must be cut off so that new growth can take place,thus starting the cycle all over again.Even new branches must sometimes be trimmed back so that they also will produce new vines.Grape vines require constant work-it never stops. Do you see the analogy yet? We are the branches that are in constant need of pruning and care. Left on our own without the care of the vinedresser, we will eventually wither and die,even while attached to the vine.The truth is that we all require a LOT of work! The message here is simple: we are not our own.We cannot sustain ourselves apart from the vine and the vinedresser.Not only must we remain attached to the vine,we must also undergo a constant pruning in order to keep producing more fruit. And may I say that oftentimes,this process of pruning is not pleasant.Fact is,it can be down right painful at times.Yet is it necessary,and there is no way around it. For you see,we are not called to the vine to simply be able to say “I belong,or I’m one of them”. No,we are part of the vine because we are part of something much bigger than ourselves.We are part of the family of God. What has to be one of the cruelest human emotions is feeling like you are all alone in this great big world. To feel as though no one cares for you can be overwhelming to the point of debilitation.When you feel this way it seems as though God Himself has forgotten you. There are so many who know this tragic state,and they come in all walks of life.See the homeless man on the corner?He understands the cold reality of loneliness.No family to call,sick,hungry,where will he sleep this cold wintry night? See the wealthy socialite posing for the cameras?She too knows the despair of another night of solitude,away from the spotlight,away from the adoring crowds.She knows all too well that loneliness doesn’t discriminate. And what about the lady next door,the one you see driving to church each Sunday? She knows loneliness as well,however her loneliness is from a different source than the others.Always quick to give out a word of encouragement to someone she knows is struggling,she is known as one who speaks the truth in love. I’m sure you’ve noticed her in your church,haven’t you?She’s the lady who tries to shake hands with as many as possible before service starts.Nothing deep or overly spiritual,just a quick “welcome, we’re so glad you’re here today”. She’s the one who calls the unloved just to let them know they are in fact,loved.She’s the one who sends out a card with a short,handwritten note that simply says “I care”. The prostitute.The addict.The unclean.The unwanted.The rejected.She loves them all. She loves deeply.And oh how deeply she hurts.For you see,her own phone never rings with the voice of encouragement.The daily walk to the mailbox never yields a card or a note,no reminders that someone cares. And so she loves. And she hurts. And she cries. A lot. She is confused.What has she done?Why has she been forgotten?She doesn’t understand why spiritual people do not sense that one of their own is hurting,and is so very lonely. “God”,she pleads,”is there no one praying for me?Is there no one taking my name before your throne?Is this desperate loneliness my reward for doing the best I knew how to do”? And she knows……..He does care.Oh how deeply He cares for her. She doesn’t hear the heavenly choir singing.No thundering’s from the throne on High.No mighty angel band. But she knows His voice.And she trusts that voice above all others. She understands that while her Lord may not change the circumstances,He will make a way for her to endure this present season. It doesn’t have to mean you have reached the end of your road. It just might mean that it leads you down a different road,one that leads you straight to Him. At least that’s what the consensus seems to be. Watching the evening news tonight I was reminded of the fact that America is living dangerously close to complete chaos.Right is no longer perceived as right.Wrong is no longer looked at as wrong.The lines are blurred to oblivion.The long fought battle to destroy Christianity and it’s value system in America is all but won. Sorry, but America long ago ceased to be a “Christian” nation. Even a cursory look into the world of church statistics will tell you that church attendance is down significantly,as is the percentage of people who say they read their Bibles. But that’s another topic for another day. Tonight I learned that not 25 miles from me a school is embroiled in a bitter battle over a girl who believes she should be a boy and be permitted to use the boys restroom.Which she has been doing(unbeknownst to parents) since school started this year,oh by the way.Parents on both sides of this (non)issue are declaring they are right. Meanwhile,another police officer was murdered today.And for what? Oh,I don’t want to forget to remind you that Wall Street is trembling again. But hey, it’s all good. To each his own. Do your own thing. Just be YOU.Isn’t this the society that the majority wants?No rules! No laws! Certainly no religion! For the life of me I cannot understand the silence of the church in the midst of all that is taking place in America.It’s as if the churches are under a gag order not to say anything against the popular opinions of our day.Why is that? Is it because our pulpits are filled with cowards who have no strength to declare the whole counsel of God? Is this what our seminaries and Christian colleges are churning out today? Famous TV Hirelings masquerading as biblical shepherds who are more concerned about building up their personal wealth portfolios then they are about calling out the fact that there is sin in the camp. Hirelings who brag about the size of their email contacts and donor lists,yet say nothing to confront the sin in their churches.Hey…did you hear about the latest greatest church conference? Everyone who is anyone will be there!! Meanwhile the poor get poorer.Hungry children grow hungrier still.The homeless shiver as they endure another night in the cold. And the church is so quiet.It sets upon untold millions of dollars while waiting for the government to ease the ills of society. Someone please explain to me how any of this lines up with the biblical model of church! Listen,people criticize me for making what they perceive as negative comments about the church.Don’t you know they say,the church is off limits to criticism! Gee…maybe that’s part of the problem. I do not criticize the church for the sake of being critical.I call it as I see it based upon actual events that I am either involved with or have first hand knowledge of.And what I see is that the church,the church that the Son of God was murdered for,has become synonymous with the world.And I am not afraid to call anyone out for the blasphemous behavior that perpetrates the church today. But wait!! It’s all good.No need to get preachy about it!! Just be YOU!! 2 Preach the word! Be ready in season and out of season. Convince, rebuke, exhort, with all long suffering and teaching. The time will come when “THEY” will not endure sound doctrine.Who is “THEY” that Paul refers to here? “They” is the church.That’s right. The time will come when the CHURCH will not endure sound doctrine. When that happens,the church becomes just another worldly institution designed to serve man and not God. Sort of like what we have now. The world can say “It’s all Good” but I see it in a different light.Looking through the lens of scripture,I’d say things were not at all good.